Dimensions 0.75 by 5 by 7.75 in. 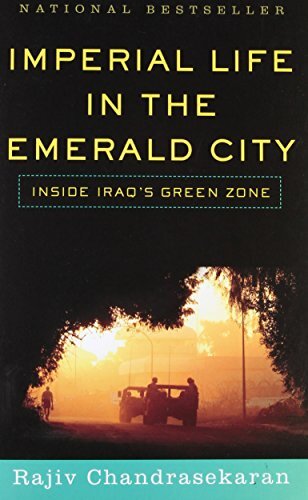 A journalist and former Baghdad bureau chief for The Washington Post furnishes a revealing look at life in Baghdad's Green Zone, the headquarters for the American occupation in Iraq, criticizing the follies and foibles of L. Paul Bremer and others in the invasion and reconstruction of Iraq. Reprint. 75,000 first printing. Amazon.com description: Product Description: A National Book Award Finalist and New York Times BestsellerThe Green Zone, Baghdad, Iraq, 2003: in this walled-off compound of swimming pools and luxurious amenities, Paul Bremer and his Coalition Provisional Authority set out to fashion a new, democratic Iraq. Staffed by idealistic aides chosen primarily for their views on issues such as abortion and capital punishment, the CPA spent the crucial first year of occupation pursuing goals that had little to do with the immediate needs of a postwar nation: flat taxes instead of electricity and deregulated health care instead of emergency medical supplies. In this acclaimed firsthand account, the former Baghdad bureau chief of The Washington Post gives us an intimate portrait of life inside this Oz-like bubble, which continued unaffected by the growing mayhem outside. This is a quietly devastating tale of imperial folly, and the definitive history of those early days when things went irrevocably wrong in Iraq. About: Presents a revealing look at life in Baghdad's Green Zone, the headquarters for the American occupation in Iraq, criticizing the follies and foibles of L.
About: From a walled-off enclave of towering plants, smart villas and sparkling swimming pools, the US-led Coalition Provisional Authority attempted to rule Iraq in the first twelve months after the fall of Saddam Hussein's regime. About: The Green Zone, Baghdad, 2003: in this walled-off compound of swimming pools and luxurious amenities, Paul Bremer and his Coalition Provisional Authority set out to fashion a new, democratic Iraq.